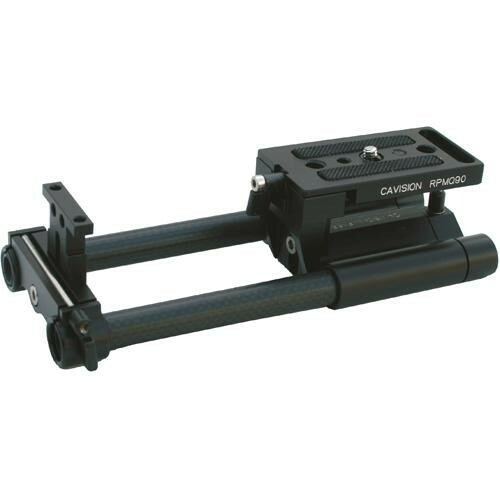 The Cavision RS-15IIMQR Rod Support System Reversed Version is designed for Mini DV Camcorders and DSLRs. This device incorporates a mounting plate, with vertical and horizontal adjustments, featuring a quick release system for tripod and handheld applications. Mini-DV plate with vertical and horizontal adjustment, offering quick release function with a reversed version. The reversed version is great for small, short lensed cameras such as Digital SLRS. Mounting Hole 1/4" & 3/8"
Box Dimensions (LxWxH) 10.2 x 3.7 x 2.4"
RS-15IIMQR Rod Support System Reversed is rated 3.9 out of 5 by 8. Rated 5 out of 5 by Anonymous from Super Solid This thing is super solid and looks great with the black and carbon fiber. Its the perfect size for a DSLR video user. Its just the right size to fit your matte box and follow focus and isnt so big you are dying carrying it around or its just too bulky to use easily. This is the reversed version of this rail system...Its better for small cameras like DSLRs but it costs about 25% more than the regular one...Thats kind of annoying when its essentially the same thing. I got the CAVISION 3x3 wide matte box and it mounts on the from bracket perfectly, and the price was definitely right compared to all the other insanely priced matte boxes out there. Rated 5 out of 5 by Mr4Lfilms from For the price Cavision is great. We shoot on a weekly bases for a nationally syndicated tv show. I have used Cavision products for years and have found them to be rugged and well manufactured. I will not say they are the best, but you have to pay a lot more to get much better. We have already used this support plate on about four shoots and I have been very impressed. It is well designed and the quick release plate comes in very handy. It is well worth the few extra dollars to buy the Cavision over the over sees knock-offs. Rated 3 out of 5 by Karine2046 from Rods Too Short The rods are a little too short when you use it with the shoulder pad and the dual handgrips. For me it's OK, but I've got a friend who would have prefer longer ones. It depends on the lenght of your arms. The little support is very useful, I use it to support my Canon 70-200. Je me sert du petit support comme support pour mon zoom 70-200. Les tiges sont peut tre un peu courtes quand on est l'paule. Pour moi a va parce que j'ai des petits bras. Et je ne mets pas de pare-soleil. Rated 2 out of 5 by Anonymous from Not a good Fit I tried this with a Panasonic GH2 DSLR, but the support platform is just too long. The camera itself is about an inch thick but the Cavision Rods Base is 3-4 inches long so you can't get a follow focus unit close enough to the camera, especially with shorter lenses. If FF or getting other attachments close to the camera isn't necessary it may work fine. The build quality is good. However, it also sits the camera fairly low so mattebox compatibility was an issue too. Rated 4 out of 5 by 6mon from Well built I really like my new shoulder Rig from Canavision with my Canon 7D. I bought the shoulder rig separately, because I didn't wan't the 8x viewfinder. I don't know why I should pay more. The easy clip could be better engineered, but it does the job for me. It is solid material. I don't feel is going to fall appart. Rated 5 out of 5 by Sony Prosumer Shooter from Good for DSLR rigs I got this for the base of a DSLR rig with the 4x4 cavision mattebox. It's very light and strong. The quick release is also nifty. Rated 3 out of 5 by Nathan from Good for the money I use this with a Letus 35 and HMC-150. The rods included work but are just barely long enough. Rated 4 out of 5 by cspada from Solid build at a fair price I wanted a cost-effective rail system that provides enough versatility to be used with my Canon XL SD and HD as well as DSLR equipment, for both film making and still image projects in field and studio environments. After thoroughly researching the available options, I decided to go for the Cavision RS-14IIMQR Reversed package, along with a pair of Cavision 15mm 14-inch length carbon fiber rods. I don't regret the decision.The product is solidly constructed of black anodized bead-blasted aluminum with carbon fiber rods, making for a lightweight but quite sturdy support system. Locking mechanisms are conveniently positioned and don't require much effort to loosen or tighten, and provide very positive stability when locked down. I did find the need for a sparing application of dry lubricant (hand-rubbed, not sprayed on) to ensure smooth movement of the bracket assembly along the longer rods. Access to the tripod platform locking control can get a bit tight if the camera mounting plate has to be dropped down a lot, but if everything is properly positioned to achieve correct alignment and balance ahead of time, there shouldn't be a need to mess around with that control during a shoot.The quick-release plate sits securely on the bridge and the adjustable alignment pin works like a charm with my equipment, easily supporting fairly weighty rigs (for example, a fully-decked-out Canon XL-H1a sporting a 20x zoom lens, an on-camera monitor, a DTE recorder on a Bracket 1 mount, a Cavision matte box, and a dual battery holder; or a Canon 5D MkII with battery grip, long zoom or telephoto lens, follow-focus, matte box) without any play or torquing. Between the front T-mount that supports a matte box or lens stabilizer and the quick-release plate bracket, there's a generous degree of vertical adjustment leeway for alignment with other accessories. If more height is needed to properly align a matte box or lens support assembly, Cavision supplies a longer T-bracket that is reasonably priced.Prior to making the purchase, I knew that I would want longer rods in order to comfortably employ follow-focus/zoom and extra brackets for long lens support, as well as the need to machine a plate that would provide horizontal movement (the latter required because this rod support system is designed to accommodate systems with a centrally oriented optical axis, which is fine for DSLRs, but not for my Canon XL equipment). The above-mentioned planned modifications added less than $ to the total cost of the rod support system, still significantly less than the other choices I considered that are offered by Cavision or other manufacturers.